Walter Calver – Undercliffe’s travelling showman. Walter Calver was a traveller and a showman. He toured the North of England with his ‘original marionettes’, travelling to the fairs at Hull, Manchester, Blackburn, Leeds, Huddersfield, Sheffield, Halifax & Bradford. He had a portable theatre which could accommodate a thousand people and children would flock to see his shows. As a special treat on Christmas day, he would entertain the children at the Bradford Workhouse. The 1851 census shows Walter was now aged 22 lodging with his brother Edward aged 17 and his father James aged 55, they were with the Ford family who were green grocers, at 14 Collier Street, Kingston upon Hull. James was said to be a Mechanical Exhibitor and Walter and Edward musician exhibitors. Also lodging at the address were William Cullin a servant and Ann Marcus a pauper aged 58. In June of that same year Walter married Elizabeth Bake at Holbeck in Leeds. He signed his name with a cross. Both his occupation and his fathers were stated as being carpenters. One of the witnesses, possibly a friend of Walters, was John Sharp Oates, a Wood Turner, sadly he died the following year, aged just 25 years. Walter was born in Kingston upon Hull and his brother Edward in Manchester. They formed a business partnership which according to Penny’s Bankrupt Gazette came to an end on the 16th Feb 1857. Perhaps by this time Edward, now aged 23 years, had decided to settle down. Walter and Elizabeth had four children at this point, James b1852 in Bradford, Ann and Sarah b1853 in Manchester and Elizabeth b1855 in Blackburn. Quite a hand full. By 1861 Edward who was now also married settled down in Holbeck to run a Grocers shop. It is not known if Walter and his family had a caravan or were taking up lodgings as they travelled from place to place, but clearly the family did travel together otherwise the children would not have been born in different locations. After 1857 more children followed, Beatrice b 1860 Leeds, Ruth Lavinia b1864 in Blackburn, and Walter b 1866 Blackburn. Press advertising helps us trace the fairs where the Calvers were exhibiting. All of these were in the industrial north of England. 1860 Jan – Market Place Bradford – Calver’s new pantomime of Blue Beard with splendid scenery and appointments. Good fires kept for the comfort of the audience. 1863 Jan – Peoples Concert Hall Manchester. Mr Calver with his marionettes has produced the drama ‘The miller and his men’ in addition to the pantomime, the working of the figures being very clever. Also in February same location – Mr Calver has performed this week ‘ Babes in the wood’ with his marionettes. 1863 May – Sheffield The main attractions were Calver’s marionettes, Taylor’s theatre, Mickey Bent’s sparring booth. 1863 Nov – Sheffield Peoples Fair, Main attractions were Mander’s collection of wild beasts, and Calver’s marionettes. In the evening the spacious dining hall was the scene of the attractive entertainment of Calver’s Marionette figures. 1864 May Leeds Royal Park Whitsuntide festival. And so the visits continued, at the various locations throughout the north of England. At the Leeds Whitsuntide festival of 1864 which was described as a gala rather than a fair, besides the ‘laughable’ marionette figures there was Mr Hall the great wizard, The New Zealand Warrior chiefs, the Bramley Military band, two balloon ascents, hand bell ringing, boards laid out for dancing, a brilliant display of fireworks, Chinese lanterns, a balloon race, and rural sports and pastimes, along with refreshments in abundance. In April 1865 an advertisement on The Era announced that ‘Calver’s mammoth marionette theatre’ would be paying its annual visit to Manchester and visiting other towns throughout the year. Calver had constructed a new portable theatre capable of seating 1000 people, it had reserved seats, a pit, and commodious gallery. The marionettes, some 500 in number measured from fourteen inches to four feet tall. Mr C also announced that he intended to retire from the business at the end of the season when the whole of the valuable exhibition, that has stood pre-eminent for forty years, WILL BE SOLD. Perhaps it was at this stage that Walter was feeling the strain of operating such a big show. Walter died in 1866 aged just 36 years. This left poor old Elizabeth with eight children to support with ages ranging from one to fourteen. However, she was soon married again to a man named John Davison, a carriage builder from Holbeck. The announcement of their wedding in the local press stated that Elizabeth Calver was the proprietor of the marionettes, so clearly she continued the business for a short while after Walter had died. There would have been other staff employed by Walter, after all, who would have transported and constructed the portable theatre at the show grounds and operated the numerous figures in the shows. By 1871 the family had settled in Manningham and probably given up the theatre altogether, the census only shows four of the children living with John Davison and Elizabeth. But by 1881 Elizabeth had become a widow again. She was now living with six of her children, four of whom were in the twenties and along with Elizabeth were working as weavers in the mill. 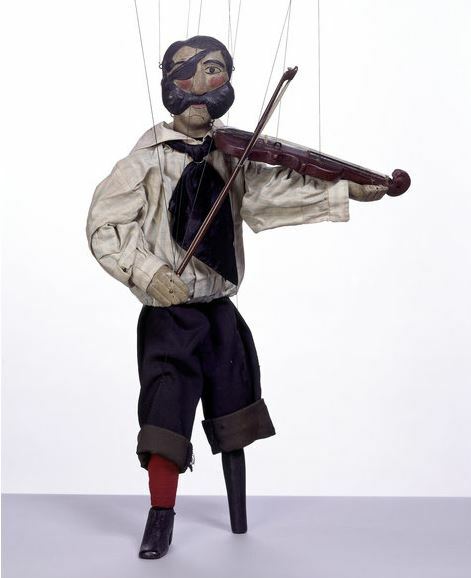 The version of Tommy shown here is one made by the Tiller family marionette company sometime between 1870 and 1890. Sadly it is kept in storage, probably in a box somewhere at the V&A Museum. When compiling this article conflicting information was found as to who ran the Calver’s show and who Walter’s family were. The book The Victorian Marionette theatre, has Edward as Walters father. A report in 1859 of a court case in Leeds has Charles Calver as being responsible for the marionettes. When the partnership broke up in 1857 some newspapers reported that it was W and E Calver and others W and C Calver. Errors can obviously occur in the reporting but the accuracy of the advertising features can perhaps be relied upon a little more. The facts that we do know is that in the 1851 census that it was James that was the father of Walter and Edward and that the announcement in 1857 of the partnership shows overwhelmingly that it was between Edward and Walter. After 1857 the advertising refers to Walter as the one that continued the business up to his death in 1866 when his wife Elizabeth ran the show most likely up about 1869. Perhaps their last show was the one at Cleckheaton. Other interesting facts have been reported about the Calver’s marionettes, such as they performed for Queen Victoria and that after Walter died his eldest son James took the marionettes to China. This cannot be confirmed until further evidence is found but James certainly did travel, he moved to Australia and settled there with his family. 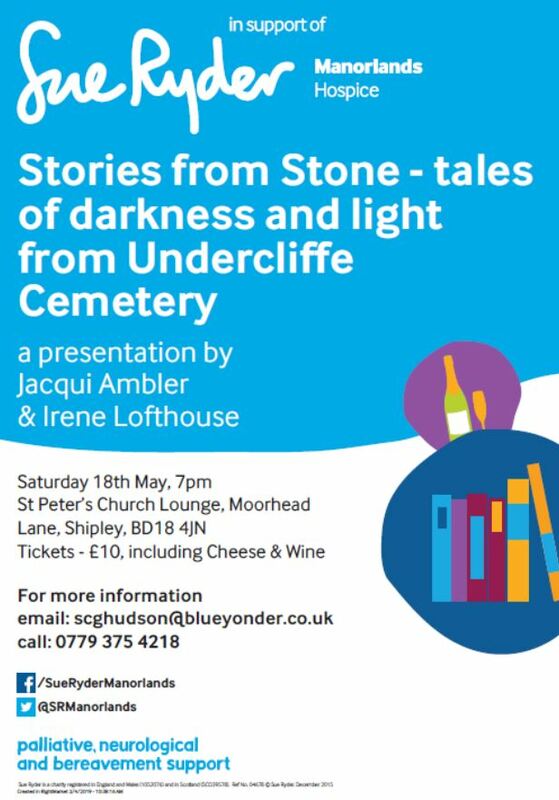 Walter is buried at Undercliffe Cemetery, alone, in peace. His wife Elizabeth and children are buried elsewhere. But Walter’s tale lives on and we can be thankful for these colourful characters from Bradford’s past. When visiting listen carefully and you might just hear the faint sound of Chorus Tommy !